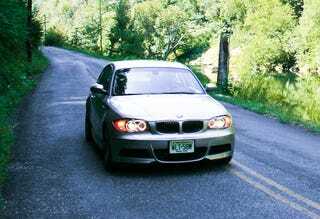 Exterior Design: **** Easily the best-looking Bangle BMW, the 2009 BMW 135i excels in proportion, if not in detail. Straight from the front, there’s little indication of the 135i’s purpose, but from there back it’s classic BMW two-door updated for the 21st century. Interior Design:*** Restraint and simplicity do the 135i’s interior many favors. Still, it would have been nice to see an even simpler approach taken without sacrificing the quality. Leather-clad Recaro sport seats would have been a good starting point. The 1-series European economy car roots show in the cheap secondary plastics used on the center console and dash. Not something we’d want in a $46,000 car.